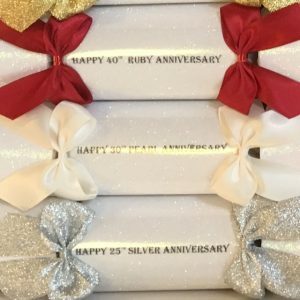 Beautiful, luxury crackers, handmade in the UK available in a range of colours to match an anniversary or colour scheme of your event. Please allow at least 3-4 weeks for delivery. All our crackers are made to order from luxury papers, ribbons and trims. These party favour crackers are made from white glittery paper, trimmed with satin ribbons and bows in a range of colours. The cracker is fully functional, complete with snap and supplied empty for your own gift. These may also be used instead of a place card by adding a name tag to the barrel of the cracker. Crackers are £2.50 each. 10% off for orders 50 and over. 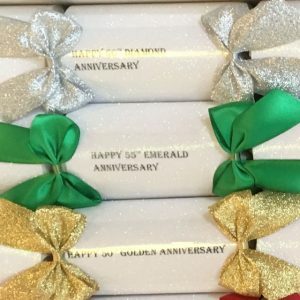 Beautiful, luxury crackers, handmade in the UK available in a range of colours to match an anniversary or colour scheme of your event. Please allow at least 3-4 weeks for delivery. All our crackers are made to order from luxury papers, ribbons and trims. These party favour crackers are made from white glittery paper, trimmed with satin ribbons and bows in a range of colours. Jars of preserves/honey are labelled with the name(s), occasion and date as a memento. The cracker is fully functional, complete with snap and supplied empty for your own gift. These may also be used instead of a place card by adding a name tag to the barrel of the cracker. Crackers are £4 each. 10% off for orders 50 and over.